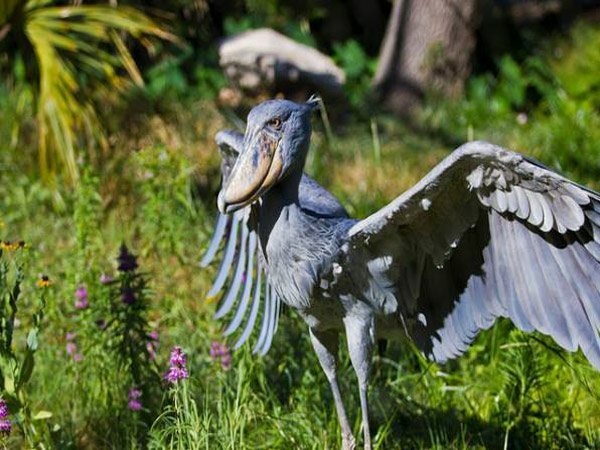 The Shoebill (Balaeniceps rex) also known as Whalehead or Shoe-billed Stork, is a very large stork-like bird. It derives its name from its massive shoe-shaped bill. Although it has a somewhat stork-like overall form and has previously been classified in the order Ciconiiformes, its true affiliations with other living birds is ambiguous. Some authorities now reclassify it with the Pelecaniformes. The adult is mainly grey while the juveniles are browner. It lives in tropical east Africa in large swamps from Sudan to Zambia.